The Howard Hughes Corporation®, in collaboration with the Howard County Arts Council, has announced the selection of artists to participate in the inaugural Merriweather District Artist-in-Residence (MD AIR) program in Downtown Columbia, MD. The artists in residence include Hoesy Corona and Eric Dyer of the Baltimore/Washington area, and Sophia Brous, an international artist working in New York and Melbourne, Australia. 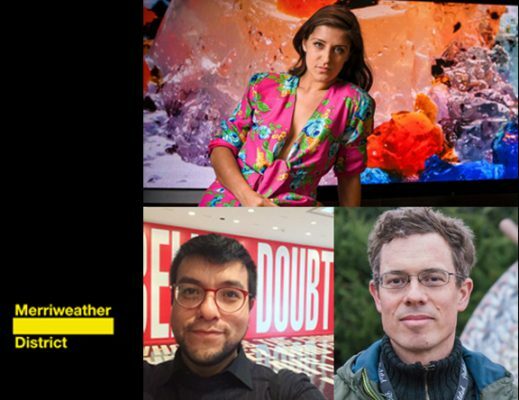 All three are multi-media, cross-disciplinary artists and will each receive a stipend of $10,000 and the use of studio space in the Merriweather District to spend up to two months, concluding August 31, creating work in a medium of their choosing. Brous is a performance-maker, musician and artistic director. Collaborating with artists, companies, festivals and concert houses internationally, she creates commissioned performance works. She is an Artistic Associate at the Arts Centre Melbourne, where she founded Supersense, a contemporary arts festival exploring ecstatic performance. During the Merriweather District residency she plans to devise a range of site-specific works with collaborators. Visit http://sophiabrous.com/about/. Corona’s project work encompasses installation, performance, sculpture, painting and public art. He is noted for his project “Alien Nation,” which was performed at the Hirshhorn Museum and Sculpture Gallery last summer. A graduate of The Maryland Institute of Art, Corona has been featured in dozens of exhibitions across the country and has extensive residency experience, including participation in the Latino Artist Residency Program in Pittsburgh. Corona is an advocate on behalf of the LGBTQ+ community. Visit http://hoesycorona.com/home.html. Dyer is an experimental animation and film artist who is known for his re-imagining of the zoetrope, a 19th century animation toy, with digital video cameras. During his residency in the Merriweather District, Dyer, who attended high school in Howard County, will create interactive animated artworks that explore the conflict between the usefulness of digital devices and the human need for physical, real-world experiences. Visit http://ericdyer.com/. Created and funded by The Howard Hughes Corporation, the MD AIR program attracted 73 applications from around the globe. The awardees were selected by a panel including artist William Cochran; Ken Farmer, curator of a New York City-based art production and design company Wild Dogs International; Howard County Arts Council Executive Director Coleen West; and Vanessa Rodriguez, Director of Marketing for The Howard Hughes Corporation. Studio space will be provided in Two Merriweather office building in Downtown Columbia’s Merriweather District. Residential accommodations will be provided within walking distance at The Metropolitan Downtown Columbia apartments. MD AIR 2018 is the first in what will be an annual program presented by The Howard Hughes Corporation to provide an opportunity for artists to spend time in the midst of Columbia’s evolving urban center. During the course of the residency, The Howard Hughes Corporation will host open studio events to showcase the work in progress and give members of the public access to the visiting artists. Works by MD AIR artists will be considered for inclusion in the second annual OPUS festival, scheduled for October 2018. Created and hosted by The Howard Hughes Corporation, the 2017 inaugural OPUS festival brought together a bold mix of art, music and technology for which Farmer was commissioned to curate an immersive, multi-sensory experience. With its large-scale art installations, mesmerizing music performances and treetop mapping project, OPUS I attracted almost 16,000 people to the Merriweather Post Pavilion®, Chrysalis amphitheater and the surrounding woodlands. OPUS reinforces The Howard Hughes Corporation’s commitment to the Merriweather District and to Downtown Columbia’s continued emergence as a regional cultural hub, and its portfolio-wide dedication to art and culture as integral components of expert placemaking. Downtown Columbia is being developed by The Howard Hughes Corporation, which owns, manages and develops commercial, residential and mixed-use real estate in 12 states, including Maryland. For more information, visit www.howardhughes.com/properties/downtown-columbia.